Finn Bell made history in this year's Ngaio Marsh Awards (to be presented next Saturday at a special event in Christchurch); the first-ever author to have two books as finalists in one year. The international judging panels for both the Best First Novel and Best Crime Novel awards were wowed by Bell's writing. They praised his incredibly strong narrative voice and sense of place, blended with page-turning storytelling and great characters. Remarkably, Bell is a self-published ebook author who has been published for just over a year, and whose tales aren't yet available in print. I wonder how long it might take before he'll be snapped up by a publisher (as happens with top ebook authors abroad). Local mystery fans have the chance to meet Finn next weekend at Scorpio Books, at the Ngaio Marsh Awards and Literary Pub Quiz. It should be a terrific evening, with most of the finalist authors in attendance, and many taking part in the quiz. In the meantime, Bell's much-anticipated third crime thriller has now been released. The mystery deepens as Nick and Tobe realize that they know every gunman lying dead here – because up to last night they were the leaders of the biggest criminal gang in the country. As the desperate search and rescue mission starts it soon collides with their own challenging investigation leading them into the center of a deeper, older tragedy. Where they begin to learn just how far someone will go for those he truly, dearly hates. 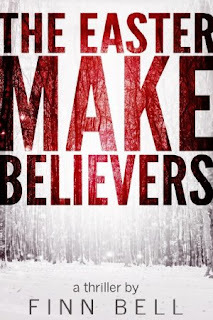 I was highly impressed by Bell's first two novels - they're two of my favourite reads of the past couple of years, so I've already downloaded a copy of THE EASTER MAKE BELIEVERS. If you'd like give this super-talented new voice a go, for a limited time you can download a free copy here.